BATON ROUGE, Louisiana, September 7, 2010 (ENS) – In Louisiana alone, there have been 399 reports of health complaints related to exposure to pollutants from the BP oil spill, according to the latest weekly report from the Louisiana Office of Public Health, issued Saturday. Of these, 313 reports came from workers and 86 from the general population. Most people complained of headache, dizziness, nausea, vomiting, weakness or fatigue, upper respiratory irritation and heat stress. Eighteen workers had short hospitalizations. A total of 2,130 people suffered injuries or illnesses related to the oil spill across the four Gulf states through July 27, the latest date for which federal government figures are available. If they wish to participate, these people could become part of a multi-year study of health effects from the BP oil spill that will be launched this fall by the National Institutes of Health. The Gulf Worker Study, announced in June by NIH Director Dr. Francis Collins, is in response to the largest oil spill in U.S. history, caused by the April 20 explosion of the Deepwater Horizon offshore drilling oil rig that released 4.1 million barrels of oil into the Gulf of Mexico. The study will focus on workers’ exposure to oil and dispersant products, and health consequences such as respiratory, neurobehavioral, carcinogenic, and immunological conditions. The study will evaluate mental health concerns and other oil spill-related stressors such as job loss, family disruption, and financial uncertainties. “Clean-up workers are likely to be the most heavily exposed of all population groups in the Gulf Coast region,” said Dale Sandler, PhD, chief of the Epidemiology Branch at the National Institute of Environmental Health Sciences and lead researcher on the study. “We plan to enroll workers with varying levels of exposure. For example, we hope to recruit workers involved in oil burning, skimming and booming, equipment decontamination, wildlife cleanup, and also those with lower exposure such as shoreline clean-up workers,” Sandler said. NIEHS is working to ensure that the people most affected by the oil spill have a say in the study’s design and implementation, as well as input into future research directions, hosting webinars and other community engagement activities to obtain input. “Community involvement and participation is critical to the success of this study,” said Dr. Linda Birnbaum, director of NIEHS and the National Toxicology Program. Dr. Collins pledged $10 million in NIH funding for the study’s initial phases and BP will contribute an additional $10 million to National Institutes of Health, part of which will be used for this study. The BP funding will come through the Gulf of Mexico Research Initiative, a 10-year, $500 million independent research program established by BP to better understand and mitigate the environmental and health effects of the spill. Collins said the National Institutes of Health will have full autonomy regarding the distribution of BP’s $10 million. “The donation from BP will help speed our work with Centers for Disease Control andl Prevention, the U.S. Environmental Protection Agency, and other federal agencies, academia, as well as state and local partners to carry out this important study,” he said. In addition, the federal Centers for Disease Control, CDC, with state and local health departments, is conducting surveillance across the four Gulf states for health effects possibly related to the oil spill using national and state-based surveillance systems. Symptoms related to the eyes, skin, and respiratory, cardiovascular, gastrointestinal, and neurological systems, including worsening of asthma, cough, chest pain, eye irritation, nausea, and headache are being tracked. NIH and the Department of Health and Human Services have been working in the Gulf since the explosion occurred. 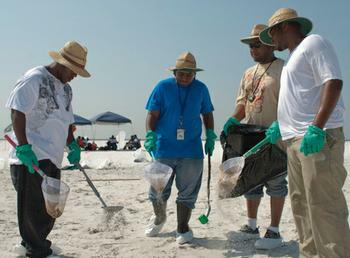 The NIEHS Worker Education and Training Program used its 24 years of experience preparing people for hazardous conditions to contribute to training more than 100,000 workers in the Gulf so they could safely clean up the oil spill. The Worker Education and Training Program distributed thousands of pocket-sized training booklets in English, Spanish, and Vietnamese, so workers have the information they need to protect themselves. The WETP materials are online at: http://niehs.nih.gov/wetp/index.cfm?id=2495.